A larger form of pebbles canons are statement rocks various sizes are avaiable from 30cm u..
Easy to walk on and added texture to a garden used with other sized pebbles for a organic ..
Great path feature pebble easy to walk on and pretty colours. Comes in 14mm only.. 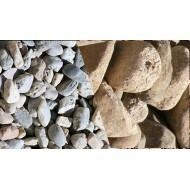 Decorative for borders and flower beds this small river pebble brings a beach effect to yo..